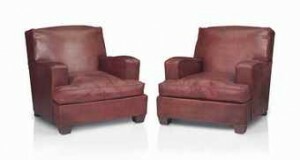 A pair of Art Deco club chairs made in 1939 by Jean-Michel Frank (1895-1941) sold for $185,000 at Christie’s Design Sale in New York. In oak with original leather upholstery they had been estimated at $150,000-200,000 and were the top lot in the sale. The lot was sold with a certificate of authenticity from the Jean-Michel Frank committee. 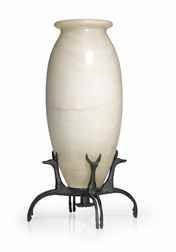 The top lot at Chrsite’s New York sale of an important collection of Art Deco masterpieces was a Fennecs table lamp c1919-1920 by Armand Albert Rateau (1882-1938). The alabaster and patinated bronze piece sold for $401,000 over a top estimate of $350,000. Christie’s say the simple design, faultless in its proportions, well illustrates Rateau’s distinctive skill at conceiving elegant, modern artefacts that distill echoes of ancient cultures. Rateau has created a form in alabaster that serves as a subtle, warming filter for the internal light source – a most effective solution to the issue of mastering electric light.